We’re living in an extraordinary time. 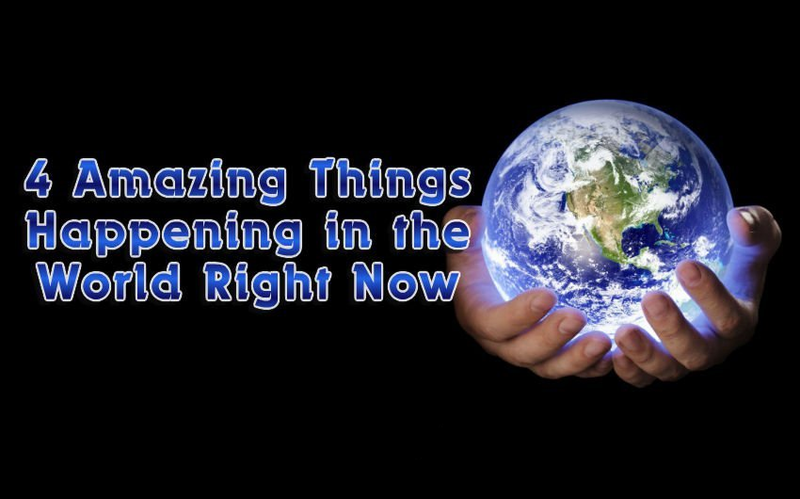 There are amazing things happening in the world and most of us haven’t even realized it yet. Remember back in 2012 when we were all half-expecting the world to end, and then it didn’t? Interestingly enough, not all of the projections for 2012 were that the world would end per se.Rather that there would be amazing things happening in the world at that time. Does anyone remember Terence McKenna, the bizarre mix of scientist and psychedelic guru? He claimed that he’d created a computer model called Timewave Zero. Timewave Zero was a model of time, which mapped out the battle between the two forces McKenna viewed the universe as consisting in: Habit and Novelty. Habit is the principle of repetition – that which conserves, but also decays. Novelty is the principle which creates, breaks off, progresses, and brings ever greater complexity. The two forces struggle together constantly, but novelty, McKenna claimed, inevitably wins. McKenna claimed that from the big bang onward, the world was getting more complexand that this complexity was increasing exponentially. He also thought that the rate of increase itself was speeding up. His computer program predicted that in 2012 this would culminate in an event he called the singularity. The singularity would be a significant event or innovation. It would result in a breakthrough to the interconnected complexity of the universe. Looking at life as it was before 2012 and life post-2012, don’t you get the feeling that something has changed? Okay – you might argue that I’m wrong to make a connection to 2012, but there are things happening in the world that suggest a transformation is taking place. One of the things happening in the world is the end of capitalism. At this stage in the information age, we’re seeing a reduced need for work because of automation. The move into the virtual world has blurred boundaries between work and free time, and between work and wages. Information is destroying the ability of the financial markets to price things correctly. The markets, after all, are based on supply and demand, and information is not a tangible thing that we can quantify. The way the financial system has tried to cope has been to try and create monopolies. We see this with the huge tech companies, but there’s no way they can last. They try to maintain the traditional business model. But the traditional business model is in opposition to the need of humanity to spread and share ideas freely. A phenomenon we’re seeing increasingly in the information age is services being offered by means of grassroots collaborations. The biggest information product in the world is Wikipedia, and Wikipedia is made by volunteers. Its services are offered for free. Wikipedia has done away with the encyclopedia industry and is robbing the advertising industry of 3 billion dollars per year. At the same time, we’re seeing parallel currencies, time banks, cooperatives and self-managed spaces becoming more and more widespread. These phenomena have flown right under the radar of the entire economics profession, which still goes on as if they don’t exist. Left and right in politics are obsolete concepts, and yet the political system seems blissfully unaware of it. Party politics is in crisis. Things happening in the world show that democracies are being thrown into chaos. Revolutions have taken place all over the world, met with violent opposition from the traditional holders of power. In countries where revolutions haven’t occurred, people have made insane political choices. They’ve been left with no other option for change. Traditional party politics are no longer relevant to the society we live in. People have lost faith in the two-party system because of the abundance of information available. They see that their interests are never backed by the options they have to choose from when it’s time to vote. 4. The end of the nation-state? A large part of the political crisis has arisen out of panic. People are panicking at what they perceive as the dissolution of borders and globalization. Many people have reacted in a conservative way, desperately scrambling to hold on to a time gone by. A time when they knew they had a nation with its own culture and values. The dissolution of the structures human beings have formed to define themselves as part of a particular group – by geographical location, language, religion, culture – is a terrifying experience for many. People have a strong emotional connection to their tribe and its values. This is not something that we should make light of or play with, either. The 1840’s was a time not unlike our own. The revolutions of 1848 across Europe arose from so many factors that it’s difficult to single out one particular cause. There were so many things happening in the world in the first half of the 19thcentury. Both liberal reforms and radical politicians were reshaping national government. Technological change had been transforming the lives of the working classes. New values and ideas, such as popular liberalism (the restriction of the church and state power) were taking over. There was a demand for republics to replace monarchies. People wanted the end of feudalism, freedom of the press and of the individual. Nationalist sentiment was rising. Socialism began to emerge – Karl Marx and Friederich Engels wrote the communist manifesto in 1848. There were environmental problems, with crop failures causing civil unrest. Even the nobility was rising up against the absolutist monarchs. It’s interesting to note that the revolutions of the 1840’s were a failure. They changed very little in terms of structural and social reform. But we must consider the things happening in the world a century later. The idealistic political movements of that decade transformed into the brutal regimesthat sprang up 100 years later. Seen from this perspective, we realize that the time we are in is an important one. And it’s crucial that we steer through it consciously and mindfully. What do you think of the views expressed in this article? Have you got anything to add? John Horgan for the Scientific American: Was Psychedelic Guru Terrence McKenna Goofing about 2012 Prophecy?